How Much Brown Can Your Lawn Tolerate? The amount of water needed for your lawn is based on soil composition. The average sandy soil can hold about one inch of water in the upper foot of the ground. The capability of soil to hold water increases with the deposit of organic material and clay. The soil with more clay or organic matter can hold a lot more water for grass growth. Soil rich in organic matter and clay is excellent for Florida’s spring season that is a dry time of the year. To determine the type of soil you have, dig down about a foot and get a handful of soil. If the soil runs through your fingers easily, it’s most likely sandy. If the soil clumps up and doesn’t breakdown a part quickly, it probably has more clay or organic materials or loam. The water retention capability depends on your soil’s composition that falls in a scale from “sandy soil” to “soil rich in organic matter with clay”. Therefore during dry seasons or droughts, the amount of water you need from your lawn sprinkler system is based on your soil’s composition. It can range from a half inch to three-fourths of an inch of water for each watering time. Sandy soil needs more water more often. For most sprinkler irrigation system that are properly designed with the correct number of sprinkler heads per zone and are well maintained, you can expect approximately a one fourth of inch of water delivered in fifteen minutes. This means your sprinklers should operate from a half hour to forty-five minutes per zone. Please note, there are county restrictions on irrigation watering, click on Resources to learn more. On long hot sunny days in Florida, your grass can use about a quarter inch of water each day. Your soil has the capability to supply water for only about four days before it starts to decline in health. The lack of adequate water can result in the unexpected appearance of dry or brown spots. When Brown spots appear, your lawn is in decline. This why having fully operational lawn sprinklers are important to keep your grass alive. Your entire yard does not have a uniform soil composition. There are areas sandier than others and some areas have richer organic matter and clay. Since your lawn depends on the soil for water and nutrients, when you lawn is deprived of water those areas with sandy soil are the first to be effected and stressed and turn brown. These brown spots will start after the grass blades shrivel or wilt and turn brown if your sprinklers are not delivering the minimum amount of water. 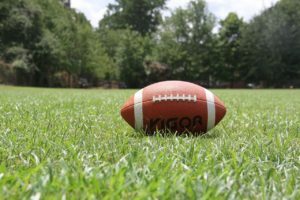 Most Florida grass such as St. Augustine grass, Centipede grass and Carpet grass will withstand a drought that last a few weeks. For extended droughts that last more than a few month, brown spots will increase and the grass will eventually die. Chinch bugs make a home in Brown Spots. Once brown spots appear, the turf pests will start to invade and get worst as the drought persists or the lack of water is prevalent. Chinch bugs are often more prolific in damaged grass that’s unhealthy or not growing normally. Nematode are microscopic worms that feed on damaged grass roots in brown spots. Florida’s pest will take over these brown spots and require Turfgrass Disease Management. 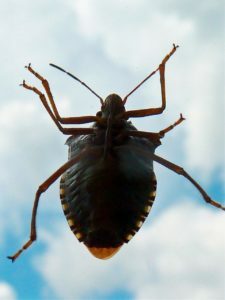 The pest population will tend to increase, if not treated early with effective pest control and disease management. Pest infestation and turf disease can ruin your lawn and may require in the worst-case an expensive lawn replacement. To get help regarding lawn care and outside pest control, click on Always Green. Please note, without fully working sprinklers with uniform water coverage, lawn care treatments may be ineffective or not able to perform properly. The cause of brown spots and the decline of your lawn’s health may be caused by broken or defective or malfunction sprinklers. You want to check to ensure your sprinklers are delivering the right amount of water for those areas with brown spots. 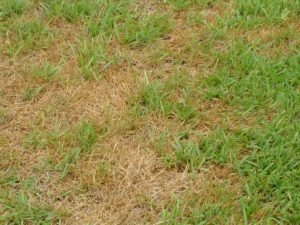 A sprinkler system unable provide the proper water coverage during dry weather conditions will be the primary reason why your lawn may turn brown, die and need a resod. To gain assistance on resodding, click on Charlie’s Re-Sod. 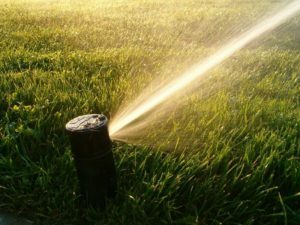 If you decide to resod, make sure the sprinkler systems is working correctly before you start the resod process. How Much Brown Can Florida Grass Tolerate? ATZ Irrigation is available to help you with your sprinkler repair problem and improving/expanding your irrigation system. Call us (727) 937-7177 or complete our Quick Service Form.